You are here: Home / Scentsy / Scentsy Sunday – Featuring February’s Warmer & Scent of the Month! Scentsy Sunday – Featuring February’s Warmer & Scent of the Month! If you don’t remember, I am now a Scentsy Consultant! I’m very passionate about these products and one of my goals for this year is to blog more about the specials going on, that way you, my wonderful readers, can get the great deals on the fantastic products Scentsy has! So I’m starting Scentsy Sunday here at Optimistic Mommy! Here is the first week’s edition! Every month Scentsy has a new Warmer of the Month, which usually shows of a great warmer that will match an upcoming holiday. Since Easter is March 31st this year, February’s Warmer is the Easter Egg! You definitely do not want to miss out on this warmer! 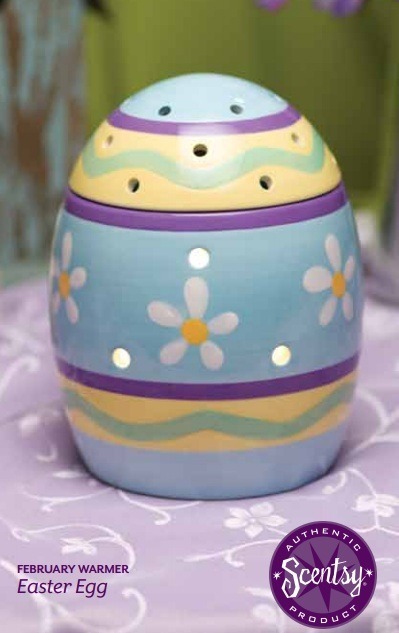 The pastel, handpainted decorations make this perfect for your Easter decorations in your home. I love how there’s a top to it to make it shaped exactly like an Easter egg! And there’s holes on top so that you can still have your yummy Scentsy bars make your home smell yummy and have the great feature of the egg! This month, you cannot beat the deal you get on the Easter Egg and Posy Peach – 10% off all through February! That makes the warmer $31.50 and the Posy Beach bar $4.50! If you want to get your hands on these wonderful products, now is definitely the time to do it! As always, if you have any questions, please do not hesitate to contact me! If you want to host a Scentsy party online, you can earn some great hostess awards! Just contact me for more details!